I've posted quite a bit about my local Forest Lawn Cemetery, here in Buffalo, New York. In early July, I spent the larger half of a slightly overcast afternoon crawling the cemetery, taking photos and videos on my phone-- the visit was very spur of the moment. It is possible I took hundreds of photos that day. Rather than overwhelming an entire post with even half of them, I've decided to break down the trip into segments. 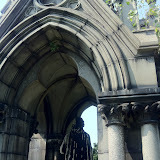 I will begin with what I think is one of the most striking monuments in the sprawling cemetery. Forest Lawn's map describes Samuel F. Pratt, for whom the memorial is made, as "One of the greatest developers of Buffalo and its industries whose imposing memorial of great decorative beauty is set off by a group of angels." I know little to nothing about Samuel, although I believe a relative of his owed the house I live in during the 1800s. And I don't know if I would deem these women figures angels; they have a very, shall we say, earthly quality to their expressions and weights. That is so beautiful and gothic that even in the hot bright sunshine of summer, it feels like fall. Autumnforest: Absolutely. The entire, sprawling cemetery is such a needed reminder, even in the dead of summer, that autumn will come back. There are so many of these Gothic, imposing figures in the cemetery, but none that have struck me as much as the Pratt Monument.